As we all know, when it comes to Italian-made cycling products, there are really just two categories that best reflect the popular interpretation of Italian form, function and tradition—shoes and saddles. 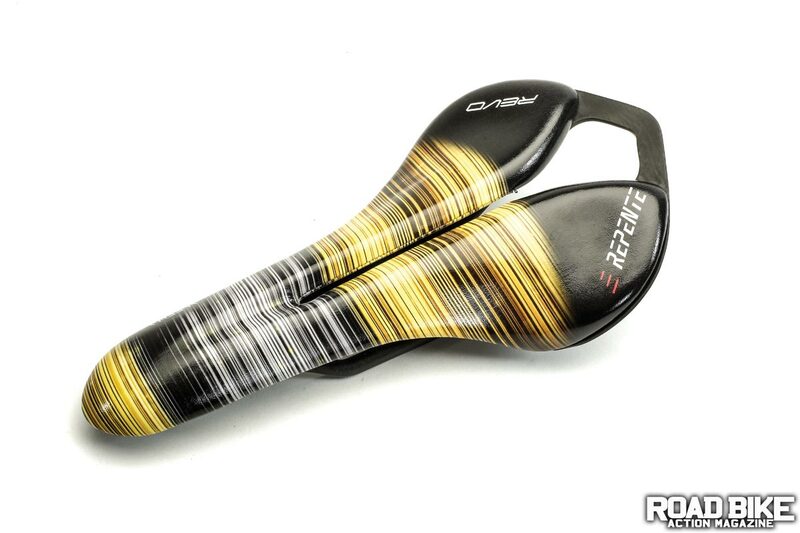 Selle Repente is the newest Italian saddle brand to jump into the sport, and they enter the market with a unique twist on the old standard. 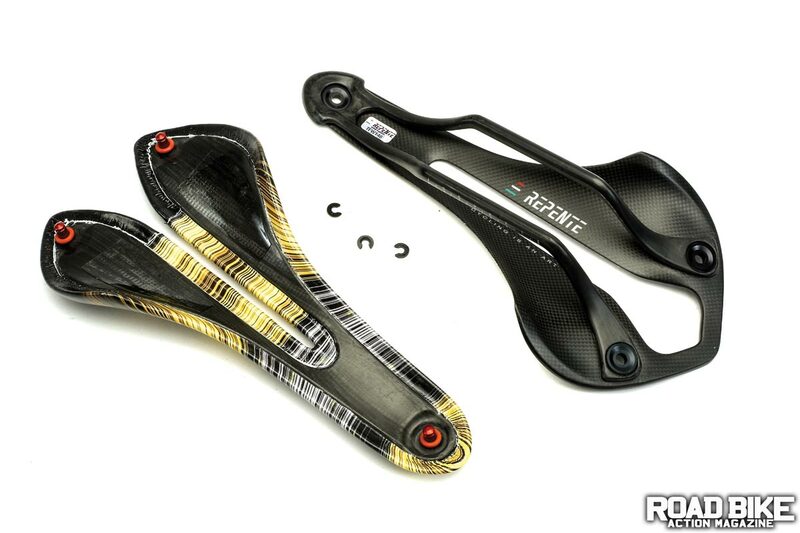 What makes the Repente saddle unique is its modular design. There are three different tops of varying thicknesses that attach to a beautifully made base. The heart of the saddle’s design is the Repente Locking System (RLS), which consists of three aluminum pins (one on the nose, two on the tail) that lock the top and base together with micro-sized Seeger rings (aka circlips). The Aleena is the one model in the line that has a cutout that runs almost the entire length of the 28cm-long saddle. It’s the cutout that plays a big role in the ride comfort. Of equal note is the Aleena’s impressive 129-gram weight. Both the base and the rails of the Aleena are made from high-end T700 carbon in an autoclave. The beautiful result reminds you of what it is that separates top-dollar Italian design from everything else. Already fans of lightweight, thinly padded saddles, the Aleena looked to fit the bill out of the box. Just a few miles into our first ride, the immediate take-away was that the yet-to-be-broken-in saddle felt like it had already been ridden for miles. In other words, no break-in period was required; it was comfortable from the get-go for us. As much as the Repente’s comfort was appreciated, it does have a lot of flex, which bothered one rider who was more accustomed to a super-firm foundation. We never used the saddle in off-road conditions, but after a few hundred miles on the road, everything held together, and we never had any problems with the RLS. Although our original trepidations about the modular system were never realized, we still made sure to remove the circlips in a controlled environment. Dropping them (or the O-rings) on the garage floor means you’d probably never be able to find them again (we told Repente they should be anodized a bright color). We definitely plan to keep riding the saddle to see what the long-term effects on the RLS will be. The Aleena is the most expensive in the Repente line, with the heavier-padded, entry-level Kuma being their version of a comfort saddle that’s priced at $325. As impressive as the 129-gram weight is, we have seen other saddles that have weighed just as little. Oh wait, those were solid carbon saddles with no padding at all! Checkmate, Repente!